“The two most terrifying creatures of all time” square off in a desolate landscape with swirling bats. A tantalizing trade ad in Universal’s Exhibitor’s Book of 1942 pitches the first Meeting of the Monsters, with Lon Chaney Jr. playing both Frankenstein AND the Wolf Man. The dual casting idea was a great publicity hook, locking in Lon Chaney as the studio’s all-purpose go-to monster guy. It made sense continuity-wise, with Frankenstein Meets the Wolf Man conceived by writer Curt Siodmak as a direct sequel to both The Wolf Man (1941), Chaney’s signature role, and The Ghost of Frankenstein (1942), in which Chaney had taken over the boots and bolts from Karloff. 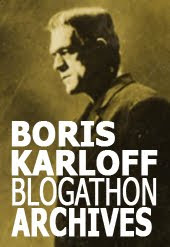 On the other hand, the trick casting would have been problematic, with expensive and time-consuming split-screen effects needed for Chaney’s Larry Talbot to interact with Chaney barely recognizable under the heavy makeup of the Frankenstein Monster. In fact, after Bela Lugosi was recruited to play The Monster, he would be spelled throughout the film by stand-ins, and the climactic “horror-battle” featured two stunt performers, with insert shots of Chaney and Lugosi snarling in closeup. 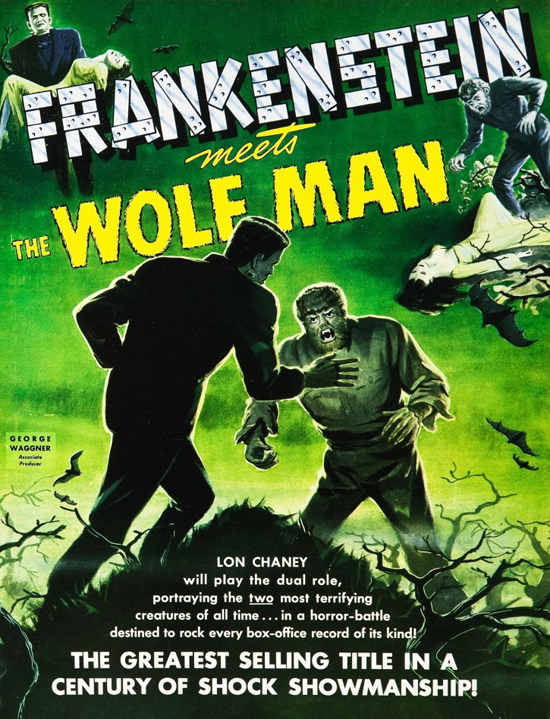 In the end, despite a difficult shoot and some choppy editing to cover its problems, Frankenstein Meets the Wolf Man turned out as one of Universal’s most entertaining sorties, its considerable success launching a series of so-called Monster Rally films that brought Frankenstein and the Wolf Man together again, with Dracula and assorted mad scientists and hunchbacked assistants thrown in, culminating in 1948 with the whole gang of monsters going up against Abbott and Costello. 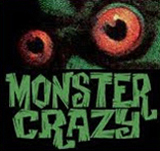 What monster fans tend to overlook today is just how silly that title itself must have seemed in 1943. I mean, SON OF FRANKENSTEIN or GHOST OF FRANKENSTEIN is one thing, but FRANKENSTEIN MEETS THE WOLF MAN?? ?Why, those folks at Universal are laughing at us...they expect us to take that seriously? Nowadays, though, the title seems natural and right. Well, to Monster Kids anyway. To civilians I imagine it's still a joke title. Another great post, Pierre. Thanks. In fact, some info seems to imply that they actually tried the Double bit for a few days, then dumped it and called Lugosi in a rush. In several of your entries re Bella Lugosi as the monster you state that he regains his sight in the final scenes during the power surge from the machines. But if you watch the movie at about an hour in Tolbot is pacing up and down he kicks a chair/stool aside and carries on with his pacing. Watch the monster standing to the left of the big fireplace he turns and in close up is watching him as proved by the moment Mannering starts the machines and Tolbot reacts, the monster freezes into his can he can’t he see pose as Tolbot runs off to demand the doctor carry out the experiment as soon as possible.